Stephens, president of the Lansing Poetry Club, said he was fighting to stay awake at a 2005 tech meeting at his former workplace when he nodded off. Catching himself, he jerked his head upright and asked his fellow employee next to him, “Was I snoring?” Twenty minutes later, he passed his completed poem down the line for people to read. “I heard the guys snickering,” he said. “Once I had the imagery, the words kind of flowed.” The Eaton Rapids resident said he sees his ability to write poetry as a gift from his mother, who also writes poetry. “I hear something that needs to be said,” Stephens said. As president of the poetry club, Stephens, 64, is in the enviable position of reigning over the club’s 75th anniversary, one of the longest runs of any poetry organization in the state. Since it was founded in a Lansing diner on Oct. 29, 1938, the organization has met once a month, except in the summer, for three quarters of a century. One of the founding members, Marjorie Rey Hanhardt, was the grandmother of member and former president Dennis North of Lansing.Initially the club consisted of 28 charter members; membership has ballooned as high as 60 in its heyday in the ‘60s, but has settled back at 28. Stephens believes that the reason the Poetry Club has had such longevity is because “people who care about poetry just keep coming.” Whether that continues for another 75 years is one of the questions Stephens and his organization hope to answer. He said the group hopes to attract younger members through future programs that interest them, such as writing hip hop lyrics. The club has two annual poetry writing contests with cash awards. Stephens said he believes that the variety of poetry that is read at the meetings is one of the characteristics of the Poetry Club that has made its longevity possible. He prefers conventional rhyming poetry, but is also attracted to Shakespeare’s style of iambic pentameter. He said it is the poetry club’s goal to show the value in writing and reading poetry. He recalls a poetry reading where he stumbled trying to read his lyrics in dim lighting before a younger person, who stepped up with a tablet, had no problem. Another longtime member, Inge Logenberg Kyler of Eaton Rapids, joined the group in 1960. She said the Poetry Club is not thriving like it was when she joined and thinks the support that fellow poets give each other in the club format is lost online. Kyler, 77, former assistant manager to Delhi Township, recently wrote a book of poetry based on local history. Preferring narrative ballads, she was inspired to write a maritime-themed poem after a recent walk across the Mackinac Bridge. Michigan poetry has an illustrious history. Hillsdale poet Will Carleton (1845-1912), whose 1872 poem, “Over the Hill from the Poor-House,” featured in his seminal book, “Farm Ballads,” captured the imagination of America. At one time, his birthday, Oct. 21, was celebrated in Michigan, with all teachers being required to teach one of his poems each year. 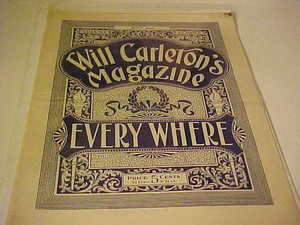 Carleton’s magazine, “Everywhere,” was a major force in America’s literary tradition. Stephens and Kyler agree that one simple move that would help inspire poetry: If the State of Michigan named a poet laureate, something that is common across the U.S.; more than 40 states have one. Michigan’s only poet laureate was Detroit Free Press writer Edgar Guest, who wrote a daily poem for the newspaper from the 1920s through the ‘50s. The U.S. has had a poet laureate since 1937, including Phillip Levine, who lived and worked in Detroit for many years, but the post of an ongoing, official Michigan poet laureate has eluded the local literary community. It came close in 2000 when a bill establishing one passed the House and Senate but former Gov. John Engler never signed it into law. The meeting had a leaden tone, Mind-numbing from the constant drone. Time stretched out like an endless loop. My eyelids lost their will to droop. I open eyes with starting jerk. Surprised to find I’m still at work. I did not snore or even drool. Still, looking ’round I feel a fool. I’m praying God to hear my prayer. I need a break to breathe fresh air. Perhaps, caffeine could get me through. Its getting late and lunchtime too. I’ve lost my mind in deep malaise. The words all blur in verbal haze. All hope is gone. It’ll never end. I’ve gone nowhere, but ’round the bend.